Factor XI (FXI) deficiency is an autosomal disorder that may be associated with bleeding. Other terms for this disorder include plasma thromboplastin antecedent (PTA) deficiency, Rosenthal syndrome, and hemophilia C (see image below). Factor XI deficiency. Graph depicts factor deficiencies. Rosenthal first described this bleeding disorder in 1953. He identified the abnormality as a factor deficiency, which he termed PTA, that was distinct from the already identified antihemophilic globulin. This disorder was found in both sexes and was understood to be inherited but was identified as being a less severe abnormality than that observed with hemophilia A and B. Also noted was that FXI deficiency occurred in patients without a family history. Since then, it has been identified in patients predominantly, but not exclusively, of Jewish heritage. FXI deficiency can manifest first as a bleeding disorder or as an incidental laboratory abnormality. The bleeding manifestations can present at circumcision (rarely) or much later in life during elective surgery. An unexpected and incidental preoperative finding of a prolonged activated partial thromboplastin time (aPTT) can be quite disruptive and may prevent the scheduled surgery. Bleeding associated with FXI deficiency is predictable neither within a patient nor within a family. In contrast to hemophilias A and B, bleeding manifestations in hemophilia C do not correlate with the FXI level. The gene controlling the production of plasma FXI is on the distal end of the long arm of chromosome 4. The gene is 23 kilobases in size. A platelet FXI that is similar, but not identical, to plasma FXI also exists. The sole site of synthesis of the FXI plasma protein is the liver. This finding is supported by 2 reports of patients undergoing liver transplant. One transplant was from a patient with known FXI deficiency, with a level of 26%. The recipient's level after transplantation was 22%. The second donor had a known prolonged aPTT, bleeding history, and was of Ashkenazi Jewish descent. The recipient's subsequent FXI level was 2%. Platelet FXI is synthesized only in the megakaryocyte. Normal dimerization is required for secretion of factor XI from the producing cell. A proposed classification system for factor XI deficiency is based on the patterns of protein production or dimerization of the FXI molecule. This system separates mutations that (1) result in decreased synthesis of the protein (Glu117Stop or Type II) producing no measurable FXI in the homozygous state, (2) abnormal dimerization of the protein (Phe283Leu or Type III) producing approximately 10% of FXI in the homozygous state, or (3) dimerization that results in the FXI protein to be poorly secreted (Ser225Phe and Cys398Tyr). This results in no measurable FXI in the homozygous state and a measurable factor XI level that is lower than the expected 50% in the heterozygous state. This third group is thought to explain the dominant mutation patterns that are seen in some families with FXI deficiency. Two predominant mutations, type II and III (using an older classification system) cause the FXI deficiency in patients of Ashkenazi Jewish descent. The type III mutation is an amino acid substitution (Phe283Leu) resulting in a missense mutation. This results in impaired dimerization and secretion of the FXI molecule. The second is the type II mutation; this causes premature chain termination and results in very low levels of circulating FXI. The type II mutation also has been found in people of Iraqi Jewish and Israeli Arabic descent. Both mutations are thought to originate from a common founder, one occurring before and one after the divergence of the Jewish people. Patients who are type II/II homozygotes have a mean factor level of 1.2%; type III/III homozygotes have a mean factor level of 9.7%, and type II/III heterozygotes have a mean factor level of 3.3%. Spontaneous bleeding was rare in all groups, but patients with the type III/III mutation had fewer trauma-induced bleeding events. All groups had more bleeding with surgeries involving surfaces with fibrinolytic activity, ie, the mouth, tonsils, and urinary tract, compared with other surgeries. Those patients with FXI deficiency who are of non-Jewish heritage are more likely to have other genetic defects. A mutation (Cys128Stop) has been found in families from the northwest area of England and has an allele frequency of 0.009, with a resultant frequency of 1 per 10,000 for homozygous or severe FXI deficiency. This explains why FXI deficiency is almost as common as FIX deficiency in the United Kingdom. It is considered that these patients, like the Jewish patients with the type II and type III mutations, also all come from a common founder. Most patients known to have FXI deficiency with the associated genetic alterations were found to have a decreased level of protein synthesis. An African American family was found to have the first genetic defect associated with functional abnormality that was out of proportion to the reduced protein level. In this family, a child and his mother had significant bleeding manifestations. The 9-year-old boy had bleeding with dental procedures and after circumcision, as well as epistaxis. He had received plasma for some of his bleeding episodes. His aPTT was minimally prolonged, and his FXI level ranged from 42-55%. His mother had bleeding in the postpartum period, after dental work, and epistaxis. Her aPTT produced normal results and her FXI level was 67-72%. The child was found to be a compound heterozygote for an abnormality in the third apple domain of the heavy chain of the FXI protein. This site includes binding sites between factor IX and platelets. In particular, the site mutation found in both the mother and the child is associated with a defect in platelet binding that interferes with FXI activation. The change in protein function found in this family, compared to decreased protein synthesis, is also consistent with an autosomal dominant form of inheritance. A second mutation (Gly555Glu) with a dysfunctional FXI protein has recently been described. New mutations are being reported in the literature, and a repository of this data is available via the FXI deficiency associated mutation database (see Human Gene Mutation Database). Development of FXI inhibitors (IgG) occurs at a rate of up to 33% in patients with severe ( < 1%) FXI deficiency after exposure to exogenous FXI, usually via plasma products. This needs to be a recognized complication of replacement therapy and evaluated for in patients before a planned invasive procedure. Epidemiologic data has shown that high levels of FXI are associated with an increased risk of venous thrombosis. Deficiency of FXI does not protect from myocardial infarction. It is not known if low levels of FXI protect from venous thrombosis. In Jewish people of Ashkenazi (European) heritage, the allele frequency is reported to be somewhere from 8-13.4%. In the non-Jewish population, FXI deficiency is observed in approximately 1 per million population. In Israel, the allele frequency for Ashkenazi Jewish people is reported to be from 8-13.4%. A second report describes 1 of 190 (0.5%) people as being affected by homozygous severe FXI deficiency. Another estimate is that severe deficiency occurs in 1 of 450 (0.2%) Ashkenazi Jews. In addition, Iraqi Jewish people carry the type II mutation at a reported frequency of 3.7%. People of Arabic background living in Israel and Jewish people of Sephardic (Spanish) background carry the type II mutation, but at a much lower frequency. In the literature, no report exists of any effect of FXI deficiency on mortality. Certainly, morbidity occurs in individuals with FXI deficiency in whom the condition remains unrecognized and who then have bleeding manifestations from surgery, dental procedures, or menorrhagia. FXI deficiency is observed predominantly in people of Ashkenazi Jewish heritage. FXI deficiency is an autosomal disorder and, therefore, should occur in equal numbers in men and women. The disorder can manifest at any age beginning from circumcision, menarche, or when dental extractions, trauma, or surgery occur. Choi SH, Smith SA, Morrissey JH. Polyphosphate is a cofactor for the activation of factor XI by thrombin. Blood. 2011 Dec 22. 118(26):6963-70. [Medline]. Rugeri L, Quélin F, Chatard B, De Mazancourt P, Negrier C, Dargaud Y. Thrombin generation in patients with factor XI deficiency and clinical bleeding risk. Haemophilia. 2010 Sep 1. 16(5):771-7. [Medline]. Saunders RE, Shiltagh N, Gomez K, et al. Structural analysis of eight novel and 112 previously reported missense mutations in the interactive FXI mutation database reveals new insight on FXI deficiency. Thromb Haemost. 2009 Aug. 102(2):287-301. [Medline]. Qu Y, Nie X, Yang Z, Yin H, Pang Y, Dong P, et al. The prevalence of hemophilia in mainland China: a systematic review and meta-analysis. Southeast Asian J Trop Med Public Health. 2014 Mar. 45(2):455-66. [Medline]. Knol HM, Mulder AB, Bogchelman DH, Kluin-Nelemans HC, van der Zee AG, Meijer K. The prevalence of underlying bleeding disorders in patients with heavy menstrual bleeding with and without gynecologic abnormalities. Am J Obstet Gynecol. 2013 Sep. 209(3):202.e1-7. [Medline]. Guéguen P, Galinat H, Blouch MT, Bridey F, Duchemin J, Le Gal G, et al. Biological determinants of bleeding in patients with heterozygous factor XI deficiency. Br J Haematol. 2012 Jan. 156(2):245-51. [Medline]. Asakai R, Chung DW, Davie EW, Seligsohn U. Factor XI deficiency in Ashkenazi Jews in Israel. N Engl J Med. 1991 Jul 18. 325(3):153-8. [Medline]. Azzi A, De Santis R, Morfini M, et al. TT virus contaminates first-generation recombinant factor VIII concentrates. Blood. 2001 Oct 15. 98(8):2571-3. [Medline]. Bauduer F, Bendriss P, Freyburger G, et al. Use of desmopressin for prophylaxis of surgical bleeding in factor XI- deficient patients. Acta Haematol. 1998. 99(1):52-3. [Medline]. Berliner S, Horowitz I, Martinowitz U, et al. Dental surgery in patients with severe factor XI deficiency without plasma replacement. 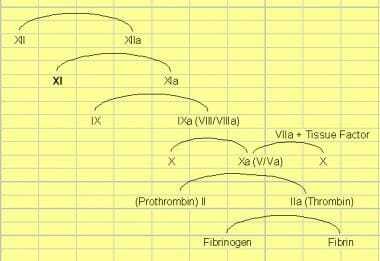 Blood Coagul Fibrinolysis. 1992 Aug. 3(4):465-8. [Medline]. Bolton-Maggs PH. Factor XI deficiency and its management. World Federation of Hemophilia Monograph. 1999:16. Bolton-Maggs PH. Factor XI deficiency and its management. Haemophilia. 2000 Jul. 6 Suppl 1:100-9. [Medline]. Bolton-Maggs PH, Patterson DA, Wensley RT, Tuddenham EG. Definition of the bleeding tendency in factor XI-deficient kindreds--a clinical and laboratory study. Thromb Haemost. 1995 Feb. 73(2):194-202. [Medline]. Bolton-Maggs PH, Peretz H, Butler R, et al. A common ancestral mutation (C128X) occurring in 11 non-Jewish families from the UK with factor XI deficiency. J Thromb Haemost. 2004 Jun. 2(6):918-24. Bonnar J, Sheppard BL. Treatment of menorrhagia during menstruation: randomised controlled trial of ethamsylate, mefenamic acid, and tranexamic acid. BMJ. 1996 Sep 7. 313(7057):579-82. [Medline]. Castaman G, Ruggeri M, Rodeghiero F. Clinical usefulness of desmopressin for prevention of surgical bleeding in patients with symptomatic heterozygous factor XI deficiency. Br J Haematol. 1996 Jul. 94(1):168-70. [Medline]. Clarkson K, Rosenfeld B, Fair J, et al. Factor XI deficiency acquired by liver transplantation. Ann Intern Med. 1991 Dec 1. 115(11):877-9. [Medline]. Coukos G, Rubin SC. Gene therapy for ovarian cancer. Oncology (Huntingt). 2001 Sep. 15(9):1197-204, 1207; discussion 1207-8. [Medline]. Dzik WH, Arkin CF, Jenkins RL. Transfer of congenital factor XI deficiency from a donor to a recipient by liver transplantation. N Engl J Med. 1987 May 7. 316(19):1217-8. [Medline]. Franchini M, Manzato F, Salvagno GL, Montagnana M, Lippi G. The use of desmopressin in congenital factor XI deficiency: a systematic review. Ann Hematol. 2009 Jul 17. epub ahead of print. [Medline]. Hancock JF, Wieland K, Pugh RE, et al. A molecular genetic study of factor XI deficiency. Blood. 1991 May 1. 77(9):1942-8. [Medline]. Hedner U, Ginsburg D, Lusher JM, High KA. Congenital Hemorrhagic Disorders: New Insights into the Pathophysiology and Treatment of Hemophilia. Hematology (Am Soc Hematol Educ Program). 2000. 241-265. [Medline]. Kadir RA, Economides DL, Lee CA. Factor XI deficiency in women. Am J Hematol. 1999 Jan. 60(1):48-54. [Medline]. Kravtsov DV, Matafonov A, Tucker EI, et al. Factor XI contributes to thrombin generation in the absence of factor XII. Blood. 2009 Jul 9. 114(2):452-8. [Medline]. [Full Text]. Kravtsov DV, Monahan PE, Gailani D, et al. A classification system for cross-reactive material-negative factor XI deficiency. Blood. 2005 Jun 15. 105(12):4671-3. Martincic D, Zimmerman SA, Ware RE, et al. Identification of mutations and polymorphisms in the factor XI genes of an African American family by dideoxyfingerprinting. Blood. 1998 Nov 1. 92(9):3309-17. [Medline]. MediView Express. Recombinant therapy enhances safety andquality of life for hemophilia patients. Paper presented at: 53rd Annual Meeting of the National Hemophilia Foundation. November 16, 2001. Nashville, Tennessee. Peretz H, Mulai A, Usher S, et al. The two common mutations causing factor XI deficiency in Jews stem from distinct founders: one of ancient Middle Eastern origin and another of more recent European origin. Blood. 1997 Oct 1. 90(7):2654-9. [Medline]. Rosenthal RL, Dreskin OH, Rosenthal N. New hemophilia-like disease caused by deficiency of a third plasma thromboplastin factor. Proc Soc Exp Biol Med. 1953. 82:171-4. Salomon O, Seligsohn U. New observations on factor XI deficiency. Haemophilia. 2004 Oct. 10 Suppl 4:184-7. Salomon O, Zivelin A, Livnat T, et al. Prevalence, causes, and characterization of factor XI inhibitors in patients with inherited factor XI deficiency. Blood. 2003 Jun 15. 101(12):4783-8. [Medline]. Saunders RE, O''Connell NM, Lee CA, et al. Factor XI deficiency database: an interactive web database of mutations, phenotypes, and structural analysis tools. Hum Mutat. 2005 Sep. 26(3):192-8. Seligsohn U. Factor XI deficiency in humans. J Thromb Haemost. 2009 Jul. 7 suppl 1:84-7. [Medline]. Seligsohn U. The activated partial thromboplastin time and factor XI deficiency. Ann Intern Med. 1986 Nov. 105(5):805. [Medline]. Seligsohn U, White GC. Inherited deficiencies of coagulation factors II, V, VII, XI, and XIII and the combined deficiencies of factors V and VIII and of the vitamin K-dependent factors. In: Beutler E, Lichtman MA,Coller BS, et al, eds. Williams Hematology. McGraw-Hill. 2001:1617-38. Siegel JE, Kouides PA. Menorrhagia from a haematologist''s point of view. Part II: management. Haemophilia. 2002 May. 8(3):339-47. [Medline]. Sun MF, Baglia FA, Ho D, et al. Defective binding of factor XI-N248 to activated human platelets. Blood. 2001 Jul 1. 98(1):125-9. [Medline]. Walsh P. Factor XI. In: Colman RW, Hirsh J, Marder VJ, et al, eds. Hemostasis and Thrombosis: Basic Principles and Clinical Practice. 4th ed. Lippincott Williams & Wilkins. 1987. Zivelin A, Bauduer F, Ducout L, et al. Factor XI deficiency in French Basques is caused predominantly by an ancestral Cys38Arg mutation in the factor XI gene. Blood. 2002 Apr 1. 99(7):2448-54. [Medline]. Zivelin A, Ogawa T, Bulvik S, et al. Severe factor XI deficiency caused by a Gly555 to Glu mutation (factor XI-Glu555): a cross-reactive material positive variant defective in factor IX activation. J Thromb Haemost. 2004 Oct. 2(10):1782-9.